So, I'm about to reach half a century of existence on this planet. An arbitrary threshold, for sure, but one that nonetheless has some psychological resonance for most human beings. In order to mark the occasion, therefore, I decided to post summaries of what I think are the most interesting technical papers I published so far (if you are actually interested in the details, feel free to drop me an email and I'll send you the full pdf; the full list of my publications is here). I welcome comments on any or all of the subject matters touched therein. I am beginning with my first academic career, in biology (I may get to my philosophical output in a few more years, it’s too short right now). You'll notice that the majority of the entries below are about conceptual, rather than empirical, papers. That's for three reasons: i) they are more likely to be of interest to a general readership; ii) they reflect my own intellectual trend, which eventually led me full time to philosophy; iii) empirical papers tend to make very local contributions to the edifice of knowledge, unless they are about spectacular discoveries (e.g., the structure of DNA, the Higgs boson), and alas mine don't fall into that category. Still, you will see examples of my empirical work nonetheless. Entries are in chronological order, this first installment basically covering the period from my PhD at the University of Connecticut (which I began in 1990) to my postdoc at Brown. Enjoy, I hope. Control of phenotypic plasticity via regulatory genes (with C.D. Schlichting, American Naturalist, 1993). There is no formal abstract for this, which was not a full paper, but a note in response to a provocative paper by Sara Via (notice the pun in the title of our paper...). Via was arguing that so-called phenotypic plasticity (i.e., the property of a genotype to produce different phenotypes in response to different environments) is in some sense not a real biological phenomenon, but rather a byproduct of natural selection within distinct environments. My then PhD advisor and I responded that there were clear cases were Via's scenario simply did not account for the data, i.e. true cases of selection favoring directly the ability of an organism to respond flexibly to heterogeneous environments. Gene regulation, quantitative genetics and the evolution of reaction norms (with C.D. Schlichting, Evolutionary Ecology, 1995). The ideas of phenotypic plasticity and of reaction norm are gaining prominence as important components of theories of phenotypic evolution. Our understanding of the role of phenotypic plasticity as an adaptation of organisms to variable environments will depend on (1) the form(s) of genetic and developmental control exerted on the shape of the reaction norm and (2) the nature of the constraints on the possible evolutionary trajectories in multiple environments. In this paper we identify two categories of genetic control of plasticity: allelic sensitivity and gene regulation. These correspond generally to two classes of response by the developmental system to environmental change: phenotypic modulation, in which plastic responses are a continuous and proportional function of environmental stimuli and developmental conversion, where responses tend to be not simply proportional to the stimuli. We propose that control of plasticity by regulatory actions has distinct advantages over simple allelic sensitivity: stability of phenotypic expression, capacity for anticipatory response and relaxation of constraints due to genetic correlations. We cite examples of the extensive molecular evidence for the existence of environmentally-cued gene regulation leading to developmental conversion. The results of quantitative genetic investigations on the genetics and evolution of plasticity, as well as the limits of current approaches are discussed. We suggest that evolution of reaction norms would be affected by the ecological context (i.e. spatial versus temporal variation, hard versus soft selection, and fine versus coarse environmental grain). We conclude by discussing some empirical approaches to address fundamental questions about plasticity evolution. Lost in Phenotypic Space: Environment-Dependent Morphology in Phlox drummondii (Polemoniaceae) (with C.D. Schlichting, International Journal of Plant Sciences, 1995). Two questions on the multivariate relationships among traits and their plastic responses were analyzed in an experiment on the phenotypic plasticity of plants from seven natural populations of Phlox drummondii from Texas to five greenhouse environments. (1) Do different environmental stresses (herbivory, low nutrients, small pot, and low water) result in similar changes among suites of traits? (2) Are the differences in plastic responses among populations large enough to alter their phenetic interrelationships? Our results indicate that the responses of plants to macroenvironmental variables are specific to that environment, evoking not only quantitative (size) but also qualitative (shape and allocation) phenotypic differences. Further, the overall phenetic similarity among populations changes radically depending upon the environment in which they are compared; i.e., apparent phenetic relationships vary with the treatment. These results demonstrate both trait- and environmental-specificity of plastic responses, leading to the production of distinct whole-plant phenotypes in different environments. Reaction norms of Arabidopsis. I. Plasticity of characters and correlations across water, nutrient and light gradients (with J. Whitton and C.D. Schlichting, Journal of Evolutionary Biology, 1995). The univariate and multivariate study of variation for phenotypic plasticity is central to providing a clear understanding of hypotheses about the genetic control and evolution of reaction norms in natural populations. 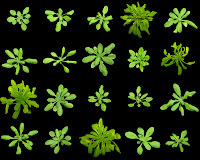 Arabidopsis thaliana is an ideal organism for the study of Genotype × Environment interactions (i.e., genetic variation for plasticity), because of the ease with which it can be grown in large numbers and due to the amount of information already available on its genetics, physiology and developmental biology. In this paper, we report on the plasticity, genetic variation and G×E interactions of four populations of A. thaliana in response to three environmental gradients (water, light and nutrients), each characterized by four levels of the controlled parameter. We measured nine traits and obtained their reaction norms. Path analysis was used to study the plasticity of character correlations. We found a tendency for A. thaliana reaction norms to be linear (either flat, i.e. no plasticity, or with a significant slope), in accordance with previous studies. We detected substantial amounts of genetic variation for plasticity in the light and nutrient gradients, but not in the water gradient. Dramatic restructuring of character correlations was induced by changes in environmental conditions, although some paths tended to be stable irrespective of the environment, thereby suggesting some degree of canalization. Developmental Reaction Norms: the Interactions among Allometry, Ontogeny and Plasticity (with C.D. Schlichting, C.S. Jones and K. Schwenk, Plant Species Biology, 1996). How micro- and macroevolutionary evolutionary processes produce phenotypic change is without question one of the most intriguing and perplexing issues facing evolutionary biologists. We believe that roadblocks to progress lie A) in the underestimation of the role of the environment, and in particular, that of the interaction of genotypes with environmental factors, and B) in the continuing lack of incorporation of development into the evolutionary synthesis. We propose the integration of genetic, environmental and developmental perspectives on the evolution of the phenotype in the form of the concept of the developmental reaction norm (DRN) The DRN represents the set of multivariate ontogenies that can be produced by a single genotype when it is exposed to environmental variation. It encompasses: 1) the processes that alter the phenotype throughout the ontogenetic trajectory, 2) the recognition that different aspects of the phenotype are (and must be) correlated and 3) the ability of a genotype to produce phenotypes in different environments. This perspective necessitates the explicit study of character expression during development, the evaluation of associations between pairs or groups of characters (e.g., multivariate allometries), and the exploration of reaction norms and phenotypic plasticity. We explicitly extend the concept of the DRN to encompass adjustments made in response to changes in the internal environment as well. Thus, ‘typical’ developmental sequences (e.g., cell fate determination) and plastic responses are simply manifestations of different scales of ‘environmental’ effects along a continuum. We present: (1) a brief conceptual review of three fundamental aspects of the generation and evolution of phenotypes: the changes in the trajectories describing growth and differentiation (ontogeny), the multivariate relationships among characters (allometry), and the effect of the environment (plasticity); (2) a discussion of how these components are merged in the concept of the developmental reaction norm; and (3) a reaction norm perspective of major determinants of phenotypes: epigenesis, selection and constraint. How organisms respond to environmental changes: from phenotypes to molecules (and vice versa) (Trends in Ecology & Evolution, 1996). The ability of organisms to produce different phenotypes under different environmental conditions (phenotypic plasticity) has been an object of evolutionary and ecological studies since the neodarwinian synthesis. Yet, until lately, our knowledge in this field was limited to statistical approaches based on the classical tools of quantitative genetics. In recent years, however, a new dialog between organismal biologists and researchers interested in uncovering the mechanistic details of physiological and phenotypic responses has yielded several new insights. Some classic examples of phenotypic plasticity have now been traced to specific alterations in DNA transcription and RNA translation rates, and to changes in patterns of protein expression. Conversely, the explicit use of evolutionary and ecological theory is helping us to put a panoply of molecular data into a coherent historical and organismal perspective. On the limits of quantitative genetics for the study of phenotypic evolution (with C.D. Schlichting, Acta Biotheoretica, 1997). During the last two decades the role of quantitative genetics in evolutionary theory has expanded considerably. Quantitative genetic-based models addressing long term phenotypic evolution, evolution in multiple environments (phenotypic plasticity) and evolution of ontogenies (developmental trajectories) have been proposed. Yet, the mathematical foundations of quantitative genetics were laid with a very different set of problems in mind (mostly the prediction of short term responses to artificial selection), and at a time in which any details of the genetic machinery were virtually unknown. In this paper we discuss what a model is in population biology, and what kind of model we need in order to address the complexities of phenotypic evolution. We review the assumptions of quantitative genetics and its most recent accomplishments, together with the limitations that such assumptions impose on the modelling of some aspects of phenotypic evolution. We also discuss three alternative approaches to the theoretical description of evolutionary trajectories (nonlinear dynamics, complexity theory and optimization theory), and their respective advantages and limitations. We conclude by calling for a new theoretical synthesis, including quantitative genetics and not necessarily limited to the other approaches here discussed. Ontogenetic phenotypic plasticity during the reproductive phase in Arabidopsis thaliana (Brassicaceae) (American Journal of Botany, 1997). While phenotypic plasticity has been the focus of much research and debate in the recent ecological and evolutionary literature, the developmental nature of the phenomenon has been mostly overlooked. A developmental perspective must ultimately be an integral part of our understanding of how organisms cope with heterogeneous environments. In this paper I use the rapid cycling Arabidopsis thaliana to address the following questions concerning developmental plasticity. (1) Are there genetic and/or environmental differences in parameters describing ontogenetic trajectories? (2) Is ontogenetic variation produced by differences in genotypes and/or environments for two crucial traits of the reproductive phase of the life cycle, stem elongation and flower production? (3) Is there ontogenetic variability for the correlation between the two characters? I found genetic variation, plasticity, and variation for plasticity affecting at least some of the growth parameters, indicating potential for evolution via heterochronic shifts in ontogenetic trajectories. Within-population differences among families are determined before the onset of the reproductive phase, while among-population variation is the result of divergence during the reproductive phase of the ontogeny. Finally, the ontogenetic profiles of character correlations are very distinct between the ecologically meaningful categories of early- and late-flowering ‘‘ecotypes’’ in this species, and show susceptibility to environmental change. Ecological and evolutionary genetics of Arabidopsis (Trends in Ecology and Evolution, 1998). 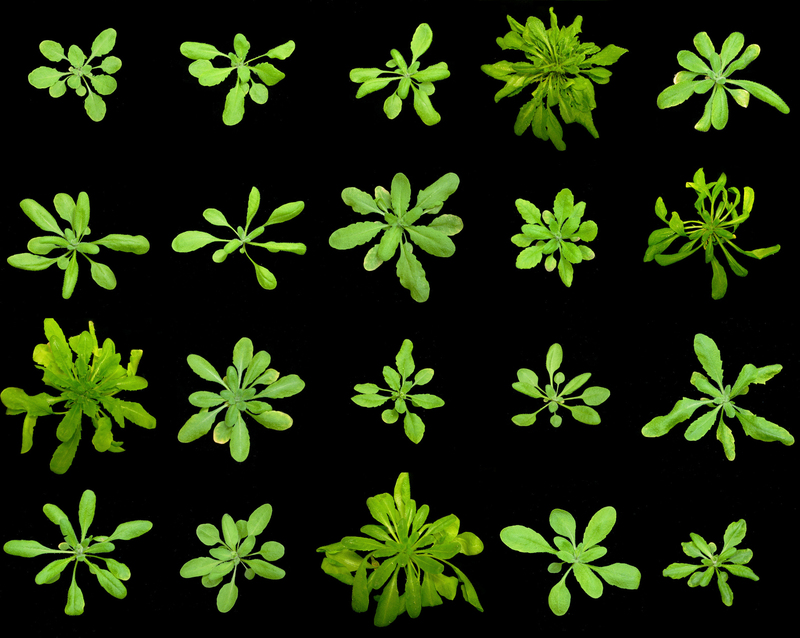 The crucifer Arabidopsis thaliana has been the subject of intense research into molecular and developmental genetics. One of the consequences of having this wealth of physiological and molecular data available, is that ecologists and evolutionary biologists have begun to incorporate this model system into their studies. Current research on A. thaliana and its close relatives ably illustrates the potential for synergy between mechanistic and organismal biology. On the one hand, mechanistically oriented research can be placed in an historical context, which takes into account the particular phylogenetic history and ecology of these species. This helps us to make sense of redundancies, anomalies and sub-optimalities that would otherwise be difficult to interpret. On the other hand, ecologists and evolutionary biologists now have the opportunity to investigate the physiological and molecular basis for the phenotypic changes they observe. This provides new insight into the mechanisms that influence evolutionary change. Genetics and evolution of phenotypic plasticity to nutrient stress in Arabidopsis: drift, constraints or selection? (with N. Byrd, Biological Journal of the Linnean Society, 1998). To better understand the genetic basis and evolution of phenotypic plasticity, we have investigated how the model plant Arabidopsis thaliana (Brassicaceae) responds to nutrient stress. A preliminary experiment showed that two populations that are very closely related genetically tended to respond in a similar fashion to a variety of nutrient stresses. We then asked if there is a general relationship between the degree of genetic differentiation of 16 natural populations of A. thaliana and the similarity in the way they cope with a fundamental nutrient stress, nitrogen limitation. We also grew plants from four mutant lines known to be affected in nitrogen uptake and metabolism, using their background isogenic line as a control. This last experiment tested whether or not defects in major genes involved in nitrogen bio- processing affect the intensity or pattern of phenotypic plasticity. We found a high degree of genetic differentiation among populations for the ability to respond to nitrogen stress. However, we detected no significant correlation between the genetic distance among natural populations and the similarity of their response to low nitrogen availability. Since the genetic distances among populations were measured using neutral molecular markers, this suggests that random genetic drift and other non-deterministic evolutionary phenomena were not the driving force shaping differences among populations in the response to stress. On the other hand, several characters were highly correlated in their responses to nitrogen limitation, suggesting either that they were modified by natural selection in a like manner, or that they are influenced by similar genetic constraints (due to either pleiotropy or tight linkage). Finally, the mutants did not differ from the parental wild type strain in their pattern of nitrogen- induced stress response. Therefore, although the genes defective in the mutants are part of the biochemical pathway that uptakes and metabolizes nitrates, we conclude that they are not involved in the control of phenotypic plasticity to nitrogen limitation in this species. Evolution of phenotypic plasticity a comparative approach in the phylogenetic neighbourhood of Arabidopsis thaliana (with K. Kammell and J. Schmitt, Journal of Evolutionary Biology, 1999). The evolution of phenotypic plasticity has rarely been examined within an explicitly phylogenetic framework, making use of modern comparative techniques. Therefore, the purpose of this study was to determine phylogenetic patterns in the evolution of phenotypic plasticity in response to vegetation shade (the `shade avoidance' syndrome) in the annual plant Arabidopsis thaliana and its close relatives. Specifically, we asked the following questions: (i) Do A. thaliana and related species differ within or among clades in the magnitude and/or pattern of plasticity to shade? (ii) Are the phenotypic variance-covariance matrices (phenotypic integration) of these taxa plastic to the changes in light quality induced by the presence of a canopy? (iii) To what extent does the variation in uni- and multivariate plasticity match the phylogeny of Arabidopsis? In order to address these questions we grew individuals from six taxa of known phylogenetic relationship in a greenhouse under full sun and under a grass canopy. Taxa differed in the magnitude, but not in the pattern, of plasticities for all traits. At the univariate level, the late flowering species, A. pumila and A. griffithiana, as well as the late flowering Moscow ecotype of A. thaliana, showed greater plasticity for allocation to vegetative and reproductive meristems. At the multivariate level, several taxa displayed a very low stability of their variance-covariance structures to environmental change, with only one taxon sharing as many as three principal components across environments. We conclude that both univariate and multivariate plasticities to vegetation shade can evolve rapidly within a genus of flowering plants, with little evidence of historical constraints (phylogenetic inertia). Genes affecting phenotypic plasticity in Arabidopsis: pleiotropic effects and reproductive fitness of photomorphogenic mutants (with J. Schmitt, Journal of Evolutionary Biology, 1999). Many plants exhibit characteristic photomorphogenic shade ’avoidance’ responses to crowding and vegetation shade; this plasticity is often hypothesized to be adaptive. We examined the contribution of specific photomorphogenic loci to plastic shade avoidance responses in the annual crucifer Arabidopsis thaliana by comparing single-gene mutants defective at those loci with wild type plants exhibiting normal photomorphogenesis. The hy1 and hy2 mutants, deficient in all functional phytochromes, were less plastic than the wild type in response to a nearby grass canopy or to a low-red/far-red light ratio characteristic of vegetation shade. These mutants displayed constitutively shade-avoiding phenotypes throughout the life cycle regardless of the treatment: they bolted at an earlier developmental stage and were characterized by reduced branching. In contrast, the hy4 mutant, deficient in blue light reception, exhibited greater plasticity than the wild type in response to vegetation shade after the seedling stage. This mutant produced more leaves before bolting and more basal branches under normal light conditions when compared to the wild type. These results indicate that specific photomorphogenic loci have different and sometimes antagonistic pleiotropic effects on the plastic response to vegetation shade throughout the life cycle of the plant. The fitness of the constitutively shade-avoiding phytochrome-deficient mutants was lower than that of the plastic wild type under normal light, but was not different in the vegetation shade treatments, where all genotypes converged toward similar shade avoidance phenotypes. This outcome supports one key prediction of the adaptive plasticity hypothesis: that inappropriate expression of shade avoidance traits is maladaptive. Manipulative Approaches to Testing Adaptive Plasticity: Phytochrome-Mediated Shade-Avoidance Responses in Plants (with J. Schmitt and S.A. Dudley, American Naturalist, 1999). Phenotypic plasticity is often assumed to be adaptive, but this hypothesis has rarely been tested. To support the hypothesis, it is necessary to demonstrate that the phenotype induced in each relevant environment confers high fitness in that environment, relative to alternative phenotypes. Unfortunately, such tests are difficult to perform because plasticity prevents the expression of "inappropriate" phenotypes within each environment. Genetic and physiological manipulation can be used very effectively to extend the range of phenotypes within environments and thus provide powerful tools for testing the adaptive plasticity hypothesis. The expression of specific genes involved in cue perception or signal transduction can be altered by mutation or the introduction of transgenes, thus altering the plastic response of an organism to environmental cues. It is also possible to alter the cue itself or to manipulate the developmental response physiologically so as to obtain alternative phenotypes. The relative fitness of these alternative phenotypes can then be measured in each relevant environment. However, these techniques will be most useful when combined with techniques such as phenotypic selection analysis to identify the specific traits under selection in natural populations. We illustrate these approaches using phytochrome-mediated “shade avoidance” responses in plants as a model system. We review the genetic and physiological mechanisms underlying these responses, illustrate how genetic manipulation can elucidate their adaptive value, and discuss the use of physiological manipulation to measure natural selection on plasticity in the wild. Mutational contributions to genetic variance-covariance matrices: an experimental approach using induced mutations in Arabidopsis thaliana (with M.D. Camara, Evolution, 1999). Genetic potential for evolutionary change and covariational constraints are typically summarized as the genetic variance-covariance matrix G, and there is currently debate over the extent to which G remains effectively constant during the course of adaptive evolution. However, G provides only a temporally restricted view of constraints that ignores possible biases in how new mutations affect multivariate phenotypes. We used chemical mutagenesis to study the effect of mutations as summarized by the mutational covariance matrix, M, in Arabidopsis thaliana. By introducing mutations into three isogenic strains of A. thaliana, we were able to quantify M directly as the genetic variance-covariance matrix of mutagenized lines. Induced mutations generally did not alter the means of the six morphology and life-history traits we measured, but they did affect the levels of available genetic variation and the covariances among traits. However, these effects were not consistent among the three isogenic lines; that is, there were significant differences among the lines in both the number of mutations produced by ethyl-methane-sulfonate treatment and the M matrices they induced. The evolutionary implications of the dependence of M on the number of mutations, the particular genetic background, and the mutagenic sampling of loci in the genome are discussed in light of commonly applied models of multivariate evolution and the potential for the genetic architecture itself to change in ways that facilitate the coordinated evolution of complex phenotypes. Congratulations on your half-century -- and thanks for sharing your papers. Best wishes for the next half-century! I also add my warm congratulations to you on reaching this milestone in such a productive way. I look forward to many more insightful, stimulating and provocative conversations as you guide us through the minefield of philosophical thought. Thanks for all the work you've done! From what I've seen, it's been quite productive. Indeed! I loved my time at Brown. Charming campus, and the city itself had interesting things to offer. Hi Massimo, something that I wanted to ask for a long time. Is the doctorate from Italy considered an equivalent to a PhD, or is it something else? Just trying to keep count if you have three PhD's or "just" two! Yes, i know they work differently, that's why I asked. And this is very impressive. I have heard about few people with two PhD's but you are the first one I know of with three. all I can say is wow, your contribution has been far greater than mine, I wasted a third of a century preparing for, enduring and recovering from war, I hope that this fuels my desire to be as productive as someone like you, and leave a mark rather than a stain. congratulation on this significant benchmark, I hope that by reading more of your work I can find that 1 percent inspiration to drive the 99 percent perspiration.